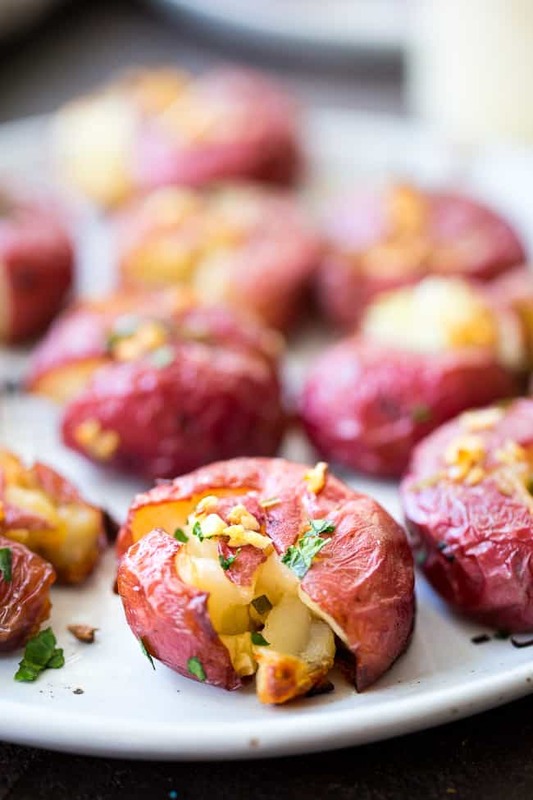 These garlic smashed potatoes are crispy on the outside, soft inside, and full of flavor! 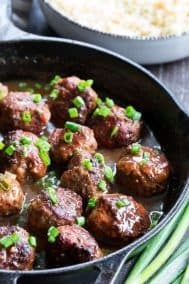 Top them or dip them in an easy 2 minute (YES!) 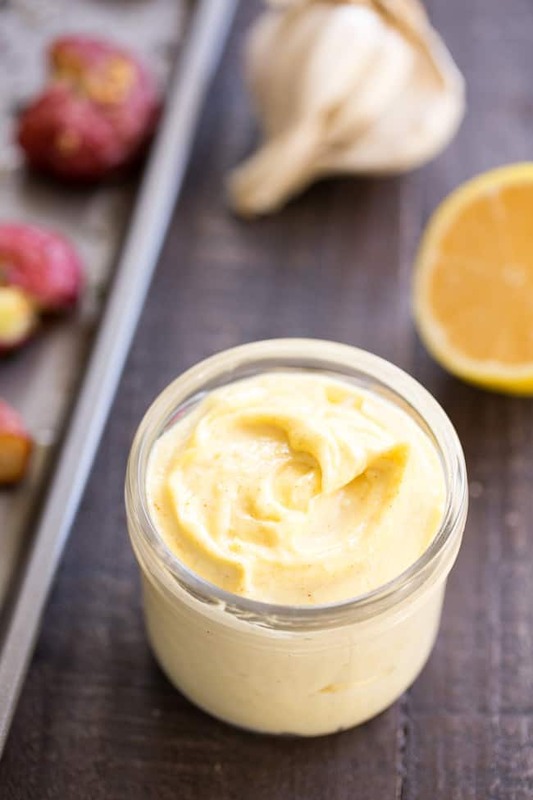 homemade aioli that’s Whole30 compliant and paleo! Dairy free, gluten free, family approved! 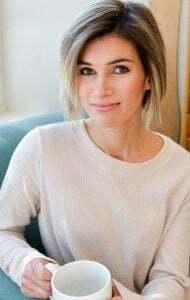 During my first Whole30 (4 years ago!) I didn’t include white potatoes (they weren’t compliant at the time) and I definitely didn’t know how to make 2 minute aioli yet. 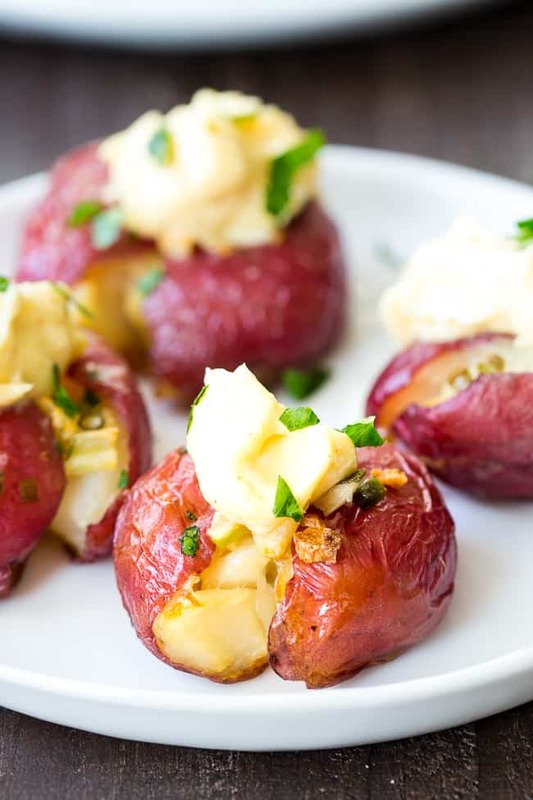 So, we’re making up for that month right here with this incredibly addicting recipe for garlic smashed potatoes and the easiest, fastest aioli you’ll ever whip up. Who could resist those crispy potatoes?! Anyway, fun fact about my first Whole30 – I started it on a whim – the day after Thanksgiving back in 2013. I’m not nearly as impulsive as I was back then, but, I’m also not as desperate, either. 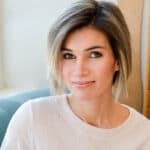 I had heard the Whole30 could help me in pretty much every single way I needed at the time, and I figured “why not right now? !” By the time the New Year hit, I honestly didn’t want the 30 days to be over. After doing my reintros, I started another Whole30 right away, and that’s basically how I ate for my first 6 months of Paleo. It was somewhere early on in those 6 months (maybe month 2?) that I started realizing I needed more sauces in my life. I tried making homemade mayo the old fashioned way – by hand – and WHOA! It actually worked and turned into REAL mayo, but, I couldn’t see myself making it by hand very often, so I decided to invest (a whole $35) in my immersion blender. Seriously, this was a total game changer! The one thing I didn’t experiment with was aioli – since in addition to Whole30, I was following a low FODMAP diet that eliminated garlic. Since then, I’ve found that I can include garlic in my diet without horrible consequences (occasionally uncomfortable, but not horrible!) and that’s where this aioli comes in. And, holy moly aioli – it’s pretty awesome stuff! 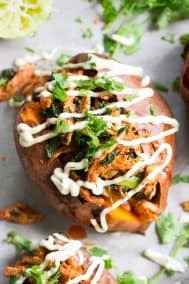 The other part of this recipe – the crispy smashed baby red potatoes – need just as much attention as the aioli! 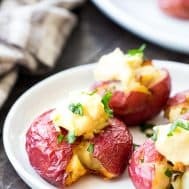 I’ve made these a few times for my family and they’re always a big hit – my kids live for that crispy outside, soft “mashed potato” inside and these smashed potatoes totally deliver! They are a bit more time consuming that regular roast potatoes, since you boil them prior to roasting, but they’re easy peasy – for real! 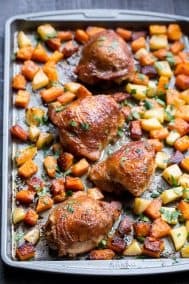 To avoid burning the garlic while still getting nice and crispy, you won’t add it until mid-way through roasting the potatoes. I made that mistake once, and kicked myself over and over for it – I should know better! And then I ate all the burn garlic, as punishment. 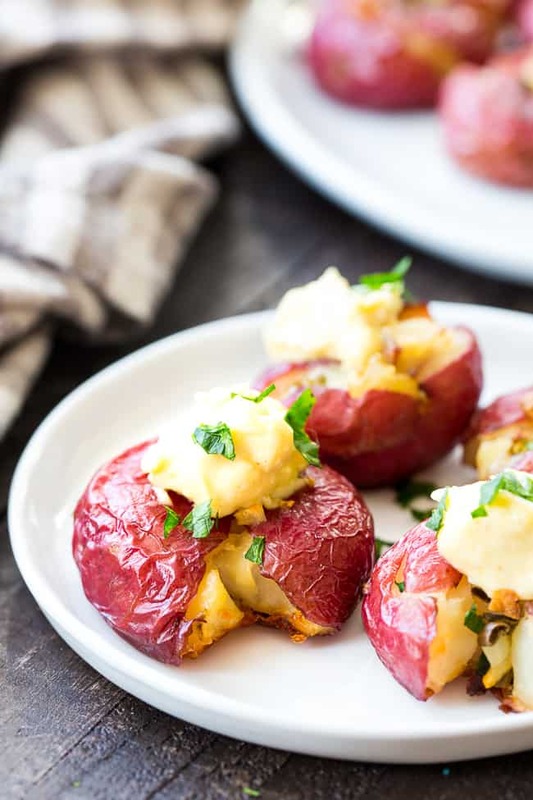 Anyway, that most certainly will NOT be happening to you – you are going to be eating these perfectly flavorful, crispy smashed potatoes with garlic aioli before you can say aioli 5 times fast. Maybe. 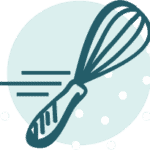 Okay enough chatter – let’s cook! 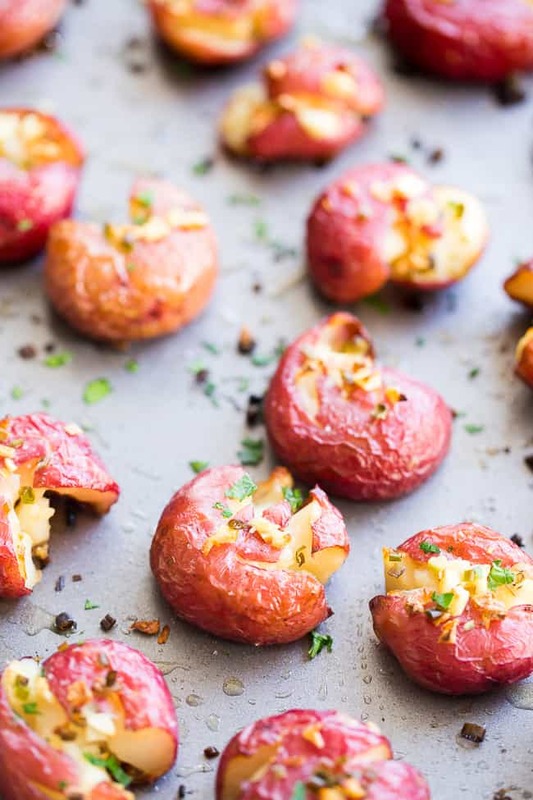 These garlic smashed potatoes are crispy on the outside, soft inside, and full of flavor! Top them or dip them in an easy 2 minute (YES!) homemade aioli that's Whole30 compliant and paleo! Dairy free, gluten free, family approved! After mincing your garlic, use the side of your knife to smash it further until it becomes pasty (makes for a smoother, more flavorful aioli.). Place in the bottom of a tall container. Add the egg, lemon juice, mustard, and olive oil. Place the immersion blender in the bottom of the container before turning it on. Then set it to high and blend for about 30 seconds before slowly lifting it to the surface of the mixture, and blend another 20 seconds or so or until completely creamy. Store in the refrigerator until ready to use. Heat a large pot with water and bring to a boil. Add the potatoes and boil until fork tender, drain and allow to cool for a few minutes. With the back of a spoon, or your hand (if they’re cool enough) carefully press on each one to flatten a bit without breaking. Drizzle the 2 Tbsp melted ghee over each potato and lightly sprinkle with salt and pepper. Mix the minced garlic and chives (if using) into the remaining tbsp of ghee - don’t put on the potatoes just yet! 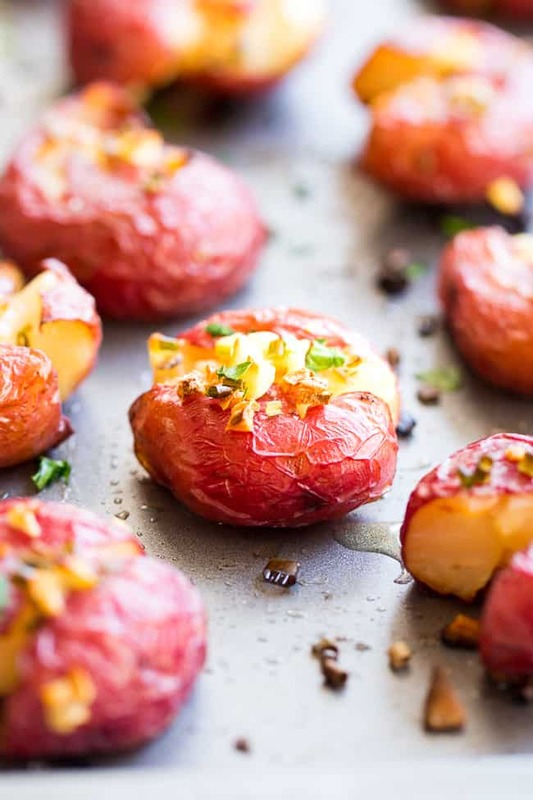 Bake potatoes in the preheated oven for 12 minutes, remove from oven, then sprinkle the garlic/ghee mixture over each potato and continue to bake another 10 minutes, or until crisp and browned. Remove from oven and serve hot, as a side dish or appetizer with the aioli. Enjoy! 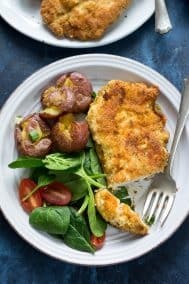 *I don't personally like how extra virgin olive oil tastes with this recipe, so I don't recommend using it! Light flavored olive oil or avocado oil will work best. 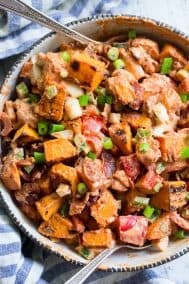 Want More Whole30 Side Dish Recipes? Try one of these! Absolutely Delish! Made it the first time tonight along side Michele’s Teryaki pork tenderloin and an arugula salad. So good. And with my left over dressing I made just make garlic frites tomorrow for lunch! 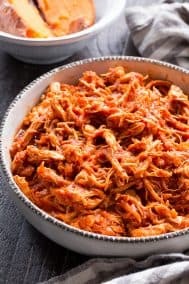 My husband loved this recipe. This blog is my go to for Whole 30 & Paleo Recipes that never disappoint. Move over, gold potatoes, there’s a new Tate in town! 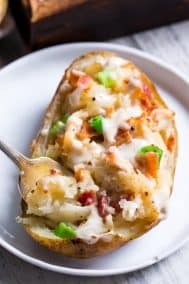 I absolutely love these red smashed potatoes, and have made them twice in the last week! 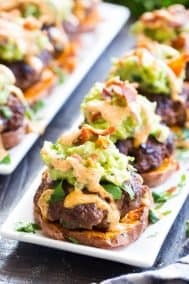 Along with the simple garlic aioli, these an instant “smash” hit in my family. The hardest part is not eating them all up. I used freshly sliced green onion in place of the dried chives. Thanks for the delicious recipe!